The black-eyed squid paralyzed the owlfish by cutting through the fish's backbone, according to Bruce Robinson, a senior scientist at the Monterey Bay Aquarium Research Institute. Robinson narrates a video of the fight between invertebrate and vertebrate, captured by MBARI's remotely operate vehicled Doc Ricketts on Nov. 11, 2013. "They were sinking rapidly the whole time, and we think that's part of the squid's tactic," Von Thun said. "We see a lot of feeding events, and oftentimes the squid gets startled and lets go, but this guy held on for the whole time that we watched it." An owlfish can flee a squid's grabby tentacles by shedding scales, slipping the grip, or by flicking its tail to dart out of reach, Robinson said in the video. 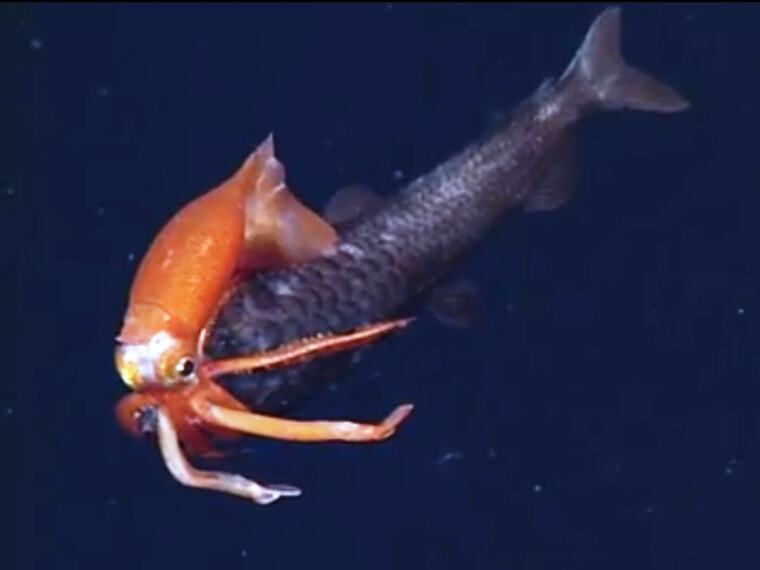 But the squid in this video is hugging the owlfish too tight for escape. Slowly, the squid twisted the fish inside its tentacles, biting over and over until it finally subdued its prey. The squid also held its tentacles over the owlfish's gill slits, perhaps in an attempt to suffocate the fish. The owlfish seen in the video is also known as a smelt, of the genus Bathylagus. It's about 10 to 12 inches (25 to 30 centimeters) long. The squid, a Gonatus onyx, is about 4 to 5 inches (10 to 12 centimeters) long. Email Becky Oskin or follow her @beckyoskin. Follow us @livescience, Facebook and Google+. Original article on LiveScience.